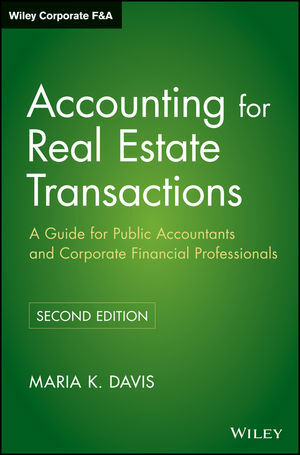 Accounting for Real Estate Transactions, Second Edition is an up-to-date, comprehensive reference guide, specifically written to help professionals understand and apply the accounting rules relating to real estate transactions. This book provides financial professionals with a powerful tool to evaluate the accounting consequences of specific deals, enabling them to structure transactions with the accounting consequences in mind, and to account for them in accordance with US GAAP. Accountants and auditors are provided with major concepts, clear and concise explanations of real estate accounting rules, detailed applications of US GAAP, flowcharts, and exhaustive cross-references of the authoritative literature. Maria Davis, CPA, Partner, Accounting Consultation Group, Deloitte, National Office, is a frequent speaker on real estate technical updates and contributor to AICPA Statement of Position, Accounting for Real Estate Time-Sharing Transactions, and AICPA Statement of Position, Accounting for Certain Costs and Activities Related to Property, Plant, and Equipment. She provides accounting guidance on technical accounting issues, primarily in the subject matters of Real Estate and Leases and joint Ventures and Consolidation, both under U.S. GAAP and IFRS. In addition to more than thirty real estate technical updates across the U.S., she has developed training materials covering accounting and real estate transactions. Over the course of her career with Deloitte, Ms. Davis has provided attest and advisory services to Deloitte's clients in a variety of industries in both the United States and Europe.